Sean Paul Ellis claims Pennsylvania as home even though he was spawned from New Jersey. Makes sense. 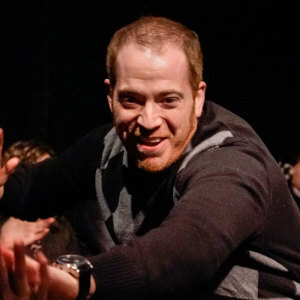 Sean has been taking classes at Washington Improv Theater since 2008, but took six years to finish it. He’s extremely lucky to have surrounded himself with talented, hardworking, and fun friends. Before founding Nox!, Sean was a member of the indie troupe DMG and WIT ensemble Caveat. He has also taught levels 1B and 3 at WIT. A board member for District Improv, Sean collaborates with others to organize the annual District Improv Festival in DC. Sean has toured and performed with the devised theater company dog & pony dc for the show A Killing Game. Recently, Sean has assisted local film collective Crowded Elevator in taking home the award for Best Screenwriting for the short film Til Death Do Us Part, submitted as a part of the 72 Hour Film Festival. You can listen to Sean ridicule and praise cartoons from the 80’s and 90’s on his podcast Saturday Mourning Cartoons on iTunes. One day he plans to rescue a pug.